You can easily write an offer to buy the assets and property of a restaurant with this downloadable template Offer to Purchase for the Province of Ontario. The offer becomes a legally binding agreement of purchase and sale once it has been accepted by the seller. 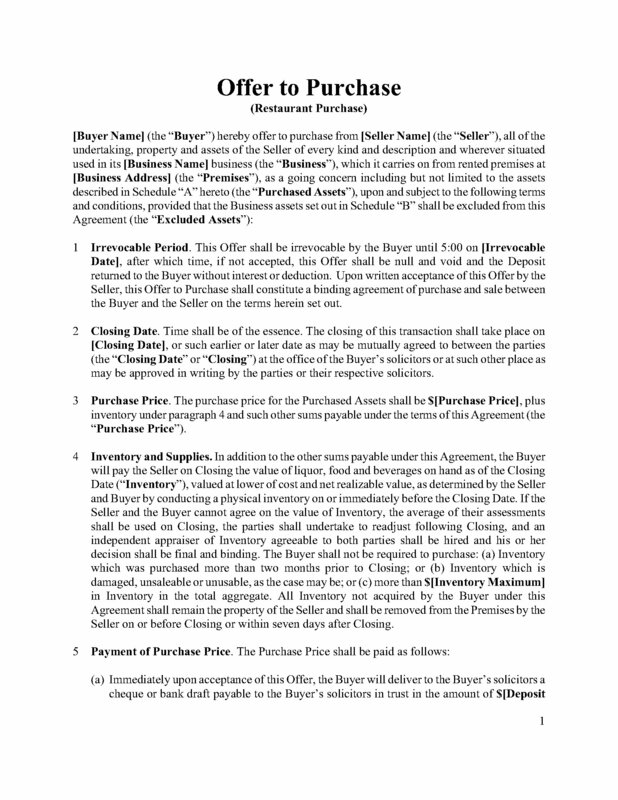 On closing, the buyer will pay the seller the value of liquor, food and beverages on hand, valued at either cost or net realizable value, whichever is lower. The buyer is not required to purchase inventory older than two months or inventory which is unsaleable or unusable. The buyer is responsible for remitting the GST applicable to the sale. The buyer will also pay retail sales tax on the purchased assets. The seller will give the buyer reasonable access to the premises, books and records of the business to enable the buyer to conduct its due diligence investigation. The agreement contains the standard representations and warranties of each party. The seller agrees not to carry on or be involved with a competing business within an agreed proximity to the restaurant, and will not solicit customers or employees from the business. The Offer to Purchase form is intended for use within the Province of Ontario, Canada. 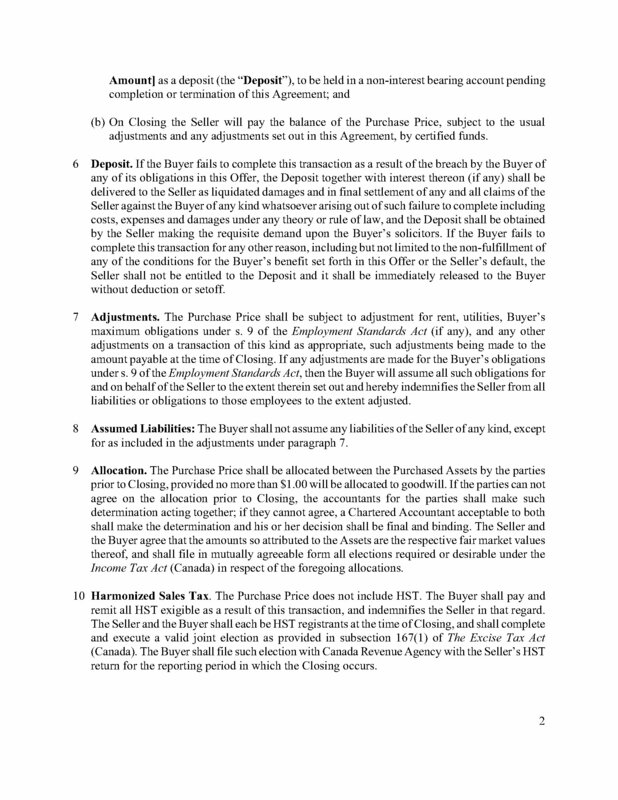 Attach this Schedule to an Asset Purchase Agreement for the assets of a restaurant business in the Province of Ontario. The seller must comply with the requirements of the Ontario Bulk Sales Act. Procedure for transferring the liquor license to the purchaser. The seller warrants that the employees are not represented under a collective bargaining agreement. 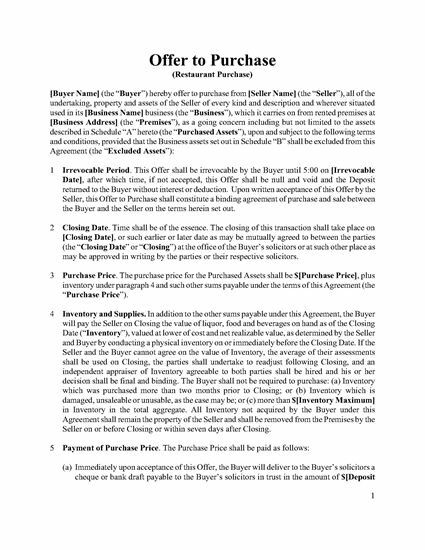 Conditions of the purchaser for closing the transaction. Representations and warranties of the seller. 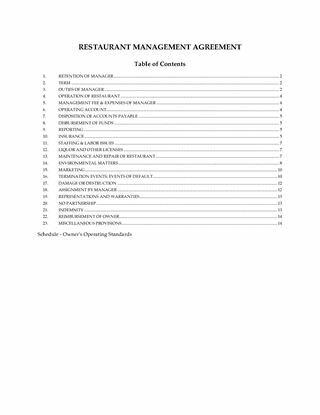 Disclosure of revenues, expenses, contracts and business information. Assignment of service contracts and leases, trade names, signage and phone numbers from the seller to the purchaser. The Schedule to Asset Purchase Agreement for Restaurant covers the special conditions that apply when purchasing restaurant assets under Ontario provincial laws. Franchise your business model for pizza and pasta restaurants to franchisees under the terms of this Franchise Agreement. This template is for Canada and makes references to Canadian franchise laws. The franchisee is granted exclusive rights to operate a franchise in the specified territory, using the trade marks and system developed by the franchisor or its subsidiaries. The franchisor will develop the restaurant premises on a turnkey basis for the franchisee, at the franchisee's expense. The Agreement contains provisions for both a turnkey and non-turnkey store opening. The franchisor will offer a pre-opening training program to the franchisee's employees and will continue to provide supervisory assistance, arrangements with suppliers, on-site training, and other operating assistance on an ongoing basis. The franchisor offers a group purchasing program to its franchisees which offers rebates and discounts on products and services, wherever available. The template includes a Guarantee and a Restaurant Sublease Agreement as schedules to the main Agreement. 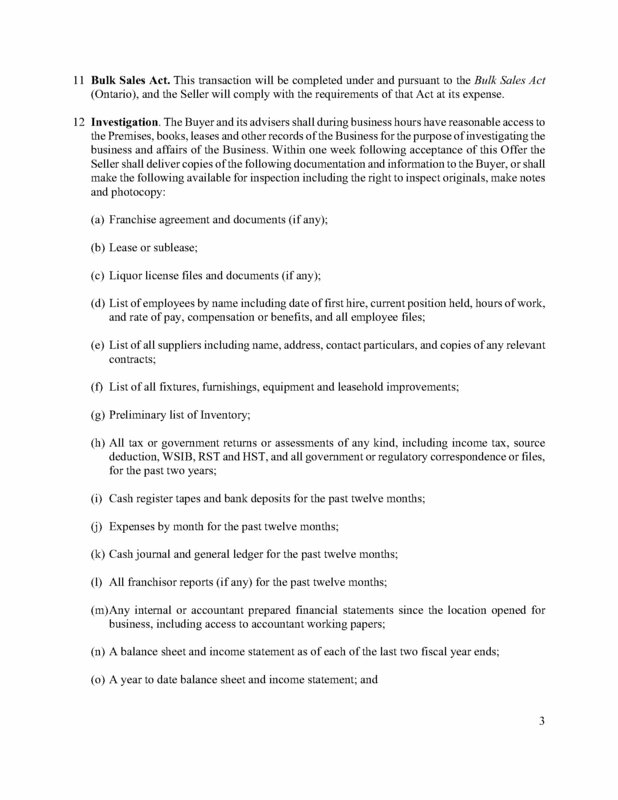 This template franchise agreement was developed by a Canadian franchise consultant. Buy and download it for your franchisees. 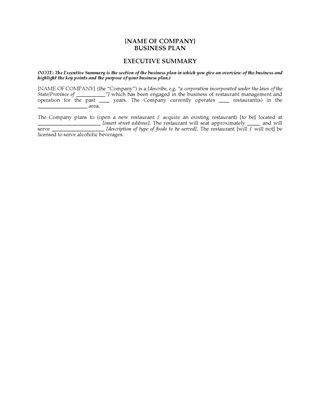 Canadian commercial landlords, lease a restaurant premises to a tenant with this Canada Restaurant Lease template. This is a triple net lease, and the tenant pays all taxes, charges and assessments on the premises, all operating costs, all utilities and services to the premises. Parking.The restaurant shares the common parking lot with other businesses in the mall or building. Indemnification. The tenant indemnifies the landlord against any claims arising from the tenant's use and occupation of the space. Use of Premises. The premises are to be used for the purposes of a restaurant only. 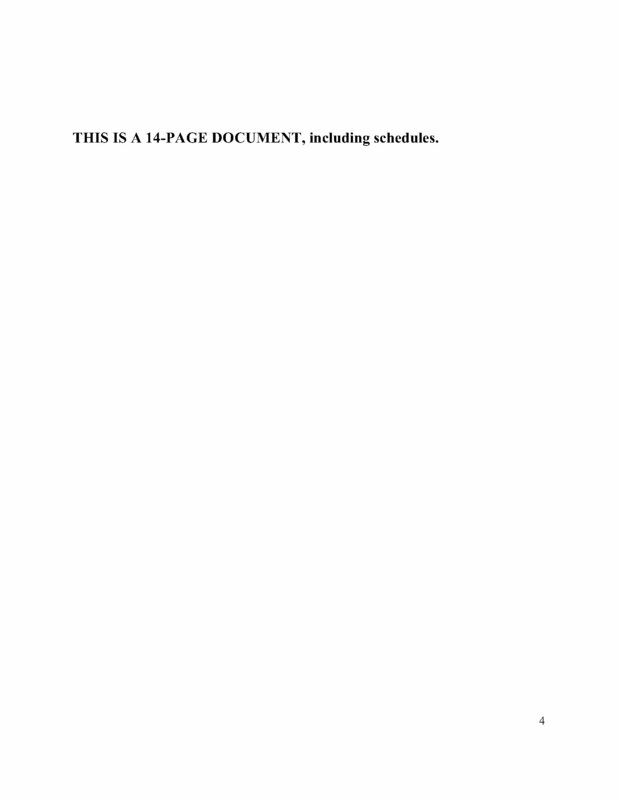 This lease can be used for a dine-in or take-out and delivery restaurant. The tenant will have the exclusive right during the lease term to sell specific food items in the building / mall. Insurance. The tenant is required to carry comprehensive general liability insurance, all risk insurance, boiler and machinery insurance (if applicable), and business interruption insurance. Events of Default. If the tenant becomes bankrupt or insolvent, or if a receiver is appointed, the current month's rent and the next 3 months' rent will become immediately payable, and the landlord has the right to recover possession of the premises. Dispute Resolution. The parties agree to binding arbitration in the event of a dispute. Don't pay big legal bills to have a lawyer draft up your documents every time you need a lease. Download your own copy of this Canada Restaurant Lease and do it yourself.